How do I point my domain name to your server? If you need help we will be happy to assist you. Can I have a shopping cart with iWeb? Because it's designed for ease of use, iWeb has some limitations as far as coding. We recommend you use Paypal to create "BUY" buttons; you can use the HTML widget to paste Paypal code onto your page. How do I upload from iWeb to your server? When you click on the Site name in the left bar, you get Site Publishing Settings. 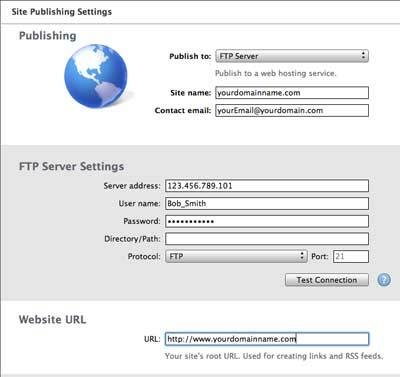 Choose FTP Server. When you sign up we will give you the settings. Have you seen strange messages on your Mac indicating you have infected files? The Mac Defender is a "fake" virus or trojan designed to make you think your computer is infected. See our page on Mac Defender.